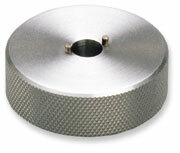 Tool for the removal of cathode retainer nut and cathode assembly. The two notches in the bottom of this stainless steel tool fit into the grooves of the cathode retainer nut to quickly remove the nut and the cathode assembly. The knurled handle provides sufficient grip to tighten the retainer nut to the proper torque eliminating the need for additional tools.